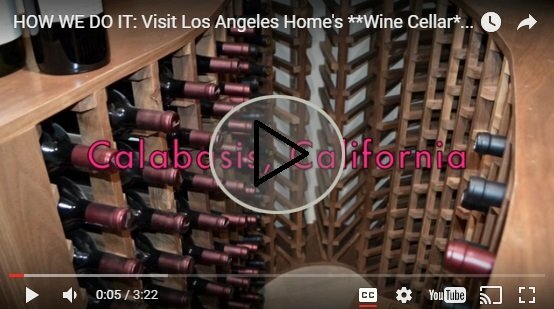 A client from Calabasas County, Los Angeles, California, who owned a residential custom wine cellar needed the help of M&M Cellar Systems. 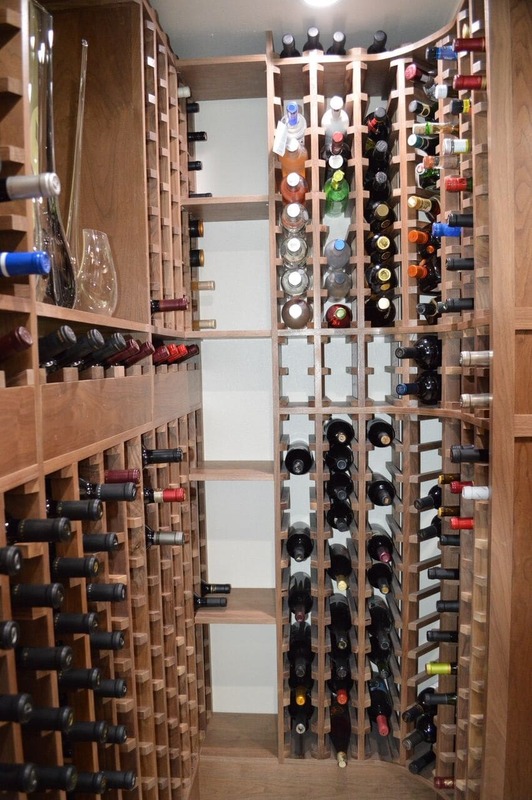 Our cooling experts installed a robust Cooling Unit for the client’s wine storage space. The refrigeration equipment did not cause any disruption to the client’s home, and it operated very quietly. In a recent construction project in Calabasas, Los Angeles County, California–we at M&M Cellars built a state-of-the-art ductless split system for a gorgeous residence’s new wine cellar. 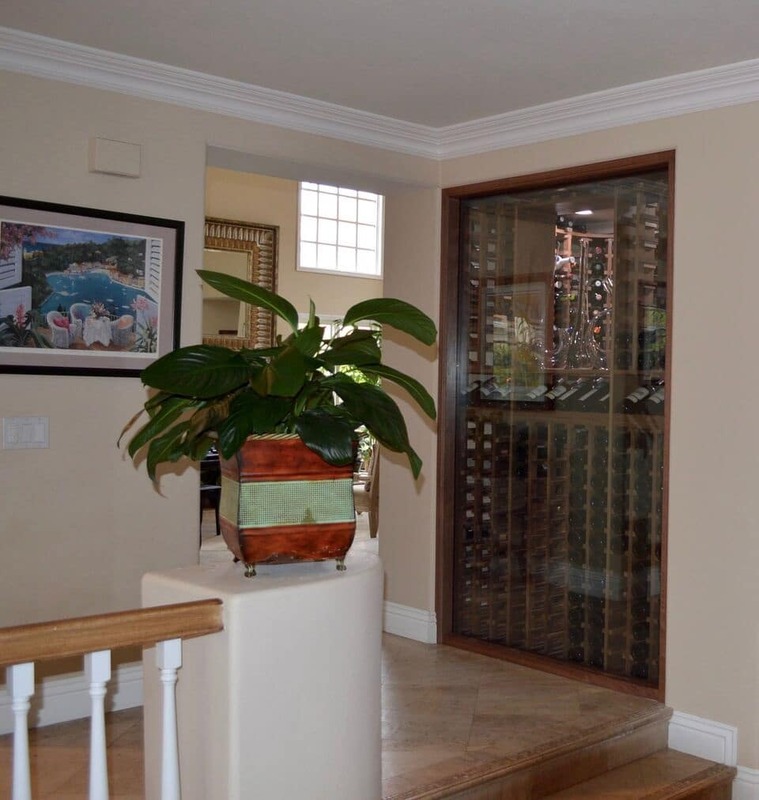 The home’s walk-in wine room with window display stands front and center as you walk in the front door, making it the prominent centerpiece to the house, while also serving the important logistical function of storing the homeowners’ wine collection. We were able to provide a commercial-grade cooling unit that satisfies the demands of this fantastic cellar. We did this using a line set, preventing the need for ducting and excess demolition. M&M Cellar Systems is one of the most trusted companies in California that provides high-quality wine refrigeration systems. Recently, a client from Calabasas City in Los Angeles County came to us for help. They needed a cooling unit installed to provide the ideal temperature and humidity to their wine storage structure. The challenge was to install the equipment without causing disruption to the house. The fan of the refrigeration system produces noise which can disrupt the peace of the home, and the condensing unit must be placed in a location where the lines are accessible. To maintain the home’s visual appeal, the client did not want wires, ducts, and any unsightly HVAC machinery seen in their home. The Rack Mount Series 4600 split type cooling system was hidden from view. The refrigeration unit was recessed into the ceiling and it was covered with louvered grills. This setup created a clean, uncluttered design. To walk through this home and see the various aspects of the project, take a tour with Mario. Click the image above. The team of expert HVAC technicians from M&M Cellar Systems decided, together with the client, to utilize a split type of cooling equipment. More specifically, they chose to install a Rack Mount (RM) Series 4600 refrigeration system. This type of unit is a dependable piece of HVAC equipment that is mounted horizontally. It features access panels that can be adjusted to suit the cooling needs of any wine storage structure. The panels are removable and allow air redirection to accommodate the unique design and layout of any cellar. The RM Series 4600 system is usually mounted with a louvered grill, so that the equipment can be hidden from view. 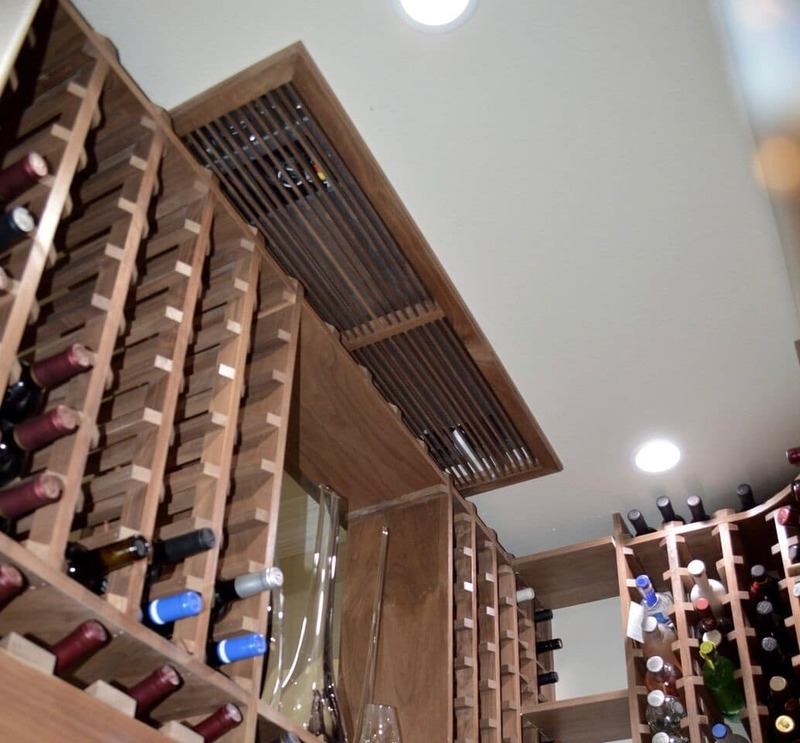 In the Calabasas wine cellar, the team for M&M Cellar Systems recessed the refrigeration system into the ceiling, so that it cannot be seen anywhere in the storage space. Louvered finish grills were added so that the cool air pushed into the cellar can be maximized. M&M Cellar Systems built the RM Series 4600 split type HVAC unit to be a robust kind of refrigeration equipment with a range of 1,800 to 6,600 BTU cooling per hour. 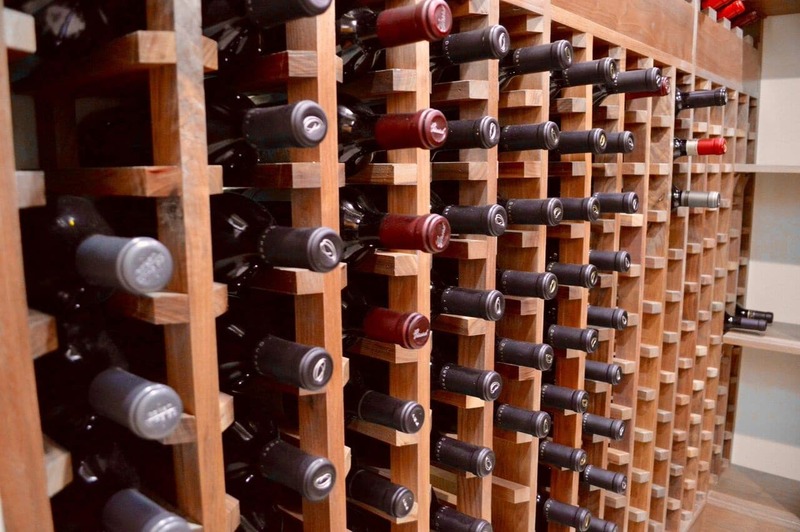 What is the best cooling unit for your wine cellar? Consult an HVAC specialist today! Click here! The line set that connected the HVAC system’s condensing unit and evaporator was hidden behind the molding. This was done to meet the client’s request of having minimal to no disruption to their home’s setup. In the Calabasas wine cellar, our team of cooling specialists installed the RM Series 4600 system without disrupting the client’s home. Standard ducting can cause a lot of disruption because of their size. So, instead of using ducts, a line set was utilized by the HVAC technicians to connect the evaporator coil to the condensing unit. This type of conduit has a hole that is only one and a half to two inches in diameter, which is adequately small and can be easily hidden from view. The crown molding on the room’s wall was removed and the line set was surface mounted, running from the cellar, across the exterior wall, and to the area where the condenser was placed. The crown molding was then put back in place to conceal the line set. The client was very pleased with the outcome of this project. Wine Cellars are a specialty service, and not the type job that you’d give to your average everyday Construction company here in Los Angeles. Just because they say they can do it doesn’t mean they actually know the requirements of wine storage. You should work with a builder who understands the important steps needed for insulation, and the materials that work the best for wine cellars, and of course, you need to have a cooling technician install your refrigeration who exclusively builds and services wine cellar climate-control systems. It is easy to recognize the quality of the condensing unit for the RM series 4600 refrigeration unit in function but also through its physical attributes. The most recognizable characteristic is the size. The condensing unit is compact compared to other bulky air conditioning units. To maintain top function, the unit is protected from outside elements such as rain and debris by a covering. The biggest difference is in its versatility. The design of the RM series 4600 refrigeration unit allows it to function in interior or exterior spaces. The small size and versatile design of the unit was invaluable to this project, as it allowed the unit to be placed outside without concern. Split type wine cellar cooling systems are a popular choice among homeowners because the HVAC equipement cannot be seen. The refrigeration system is configured in such a way that the condenser is not placed in the same room as the evaporator. Separating the condensing unit means that the evaporator can function quietly inside the wine cellar. Two lines were installed to connect the condensing unit to the evaporation unit in the wine cellar: the liquid line and the suction line. The liquid line is an outgoing line, meaning it connects to the evaporator coil inside the wine cellar. After the air has cooled the room, the suction line takes the air back outside to the condensing unit. The liquid line, or ‘hotline’, of the condensing unit carries hot liquid over the evaporator coil. It is important that it is a liquid and warm because it needs to boil off instantly once it reaches the coil. This will only happen if there is a difference in air temperature, which is why it is in a liquid state and warm. Liquid refrigerant is sprayed in while the liquid is moving towards the evaporator coil. As the mixture boils off, the refrigerant becomes a vapor and in turn absorbs the heat in the wine cellar. This process cools the wine cellar. The cooled air is circulated and then must be routed out of the room. This is accomplished through the suction line. Air is pulled into this line and pushed into the condensing unit where it is expelled outside of the home. It is common for suction lines to ‘sweat’ or have water bead on the outside of the line because the air is so cold. M&M Cellar Systems always insulates their suction lines, as they did at this Los Angeles home, to prevent water forming in the walls. This may not be a step that average companies would know about wine cellar construction. The client in this Calabasas HVAC installation project wanted a cooling system that would perform quietly and cause minimal disruption to the home. The RM Series 4600 refrigeration unit was the perfect piece of equipment to install. This split type of cooling system is configured in such a way that the condensing unit is placed in a separate room from the evaporator. Because the fan on the condensing unit is the noisy component, relocating it allows the evaporator unit in the wine cellar to function quietly. Instead of intruding into another room in the Calabasas home, the condensing unit was installed on the outside of the house. M&M Cellar Systems knows the curb appeal of the home is just as important to the client as the visual appeal inside the home. To prevent the lines from becoming an eye sore the team placed a cover over the lines running into the house. The home will now remain quiet and the aesthetic value of the home will not be compromised, all while maintaining the cool temperature in the client’s wine cellar. A look inside the wine cellar allows us to see spaces that can now be used for wine storage instead of holding the cooling unit. This makes the flow of the wine room more smooth, and increases the bottle capacity. The RM evaporator coil was hidden in the wine cellar by our team recessing it into the ceiling. The only visible sign of the coil is a commonplace grill. This Louvre style grill is the best choice for cooling a wine cellar because it allows maximum air flow without restriction. As well, the grill is easy to remove so anyone can access the coil if needed. The owner specifically designed the racking below the grill so bottles wouldn’t need to be moved when the coil does require maintenance. The line set carries the refrigerant between the condensing unit and the coil as it changes stages, and so must run throughout the home to reach the wine cellar. It consists of two pipes that correspond to each stage of the refrigerant: your high-line and your low-side. The high-line is the liquid line, so it carries the refrigerant to the coil as a liquid. The low-side is your suction line, so it pulls the vapor refrigerant out of the cellar. Two elements play into the seamless flow of this wine cellar: glass and a split cooling system. The glass makes this looks like it just sits in the home naturally. The split cooling system allows the inside space to smoothly transition from rack to wall to rack, without breaking up the visual appearance with a bulky cooling system. To conceal the line set the team ran it out to the side of the house. It took just 35 feet to run the pipes from the inside of the cellar out to the side of the house. The equipment operates at an optimal performance when it is within 50 feet, so that was within range for this cellar. M&M Cellar Systems can run the pipes at distances of up to 100 feet without losing performance because they know how to size out the line set correctly: the further from the house the bigger they need to make it. Building a wine cellar in the center of the house can become a challenge when you are installing a cooling system because there are no exterior walls. Without these exterior walls, the line set can’t run to the outside of the home without becoming intrusive to the home by drilling several holes for the pipes. In this installation, M&M Cellar Systems was able to use the space between the ceiling and the second floor to hide the pipes. As well, the team only needed to drill two small holes to install the pipes, since we were able to access everything from inside the wine cellar. Minimal drilling is ideal because it means less work, less demolition to the existing walls, and less space is taken up in the wine room. The visual seamlessness of a room, rather than a fragmented view from bulky refrigeration equipment, is significant to many customers because it also frees up more space. That area can be used to store more bottles or include extra features. 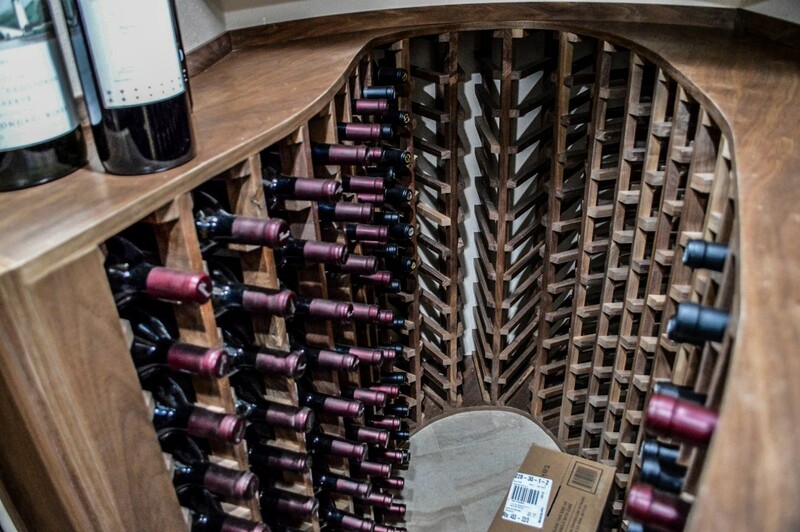 That extra storage becomes critical when a customer has an extensive collection of wine and needs to maintain their bottle count or find space for additional storage. The Rack Mounted Evaporator coil allows the unit to be out of sight because it is literally out of the room, clearing up space. This wine cellar is a perfect option for high-performance cooling and maximum storage without seeing the refrigeration system. It is easy to hide the coil of the unit because the team can recess it into the ceiling. The only indicator of cooling equipment in the ceiling is the grill, which effortlessly blends in as a familiar vent cover. 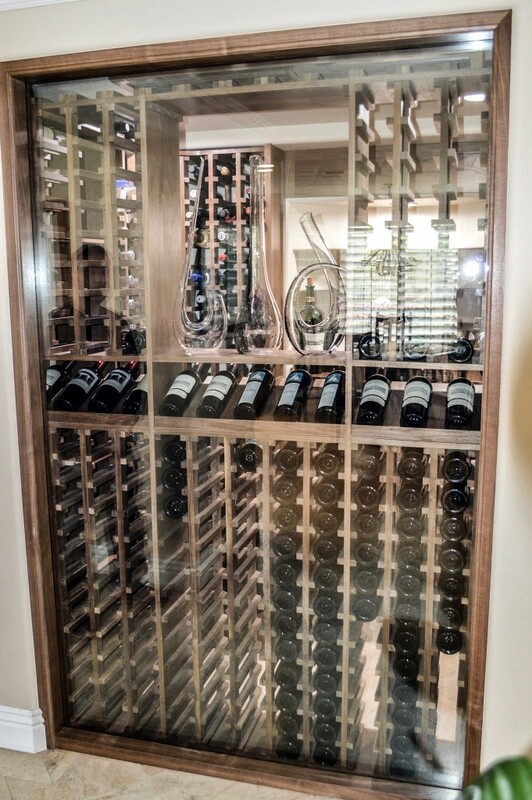 Installing a refrigeration unit into the wine cellar of this Calabasas home could easily have boiled down to adding a piece of bulky equipment to the room—but not for M&M Cellar Systems. We consider the needs of the client and find solutions with them for cooling their wine cellar the way they want. And just as we did in this project, we work hard to find the method to install the equipment with the least amount of work and intrusion to your home. Founded in 2011, M&M Cellar Systems is now one of the most trusted experts in the wine cellar cooling construction industry. Based in Los Angeles, California, our family-owned business takes pride in consistently providing high-quality HVAC refrigeration and heating installation services. We offer state-of-the-art climate control systems for both commercial wine displays and residential wine cellars. M&M Cellar Systems gives utmost priority to providing customer satisfaction. All of our HVAC technicians are well-trained and highly skilled at providing exceptional service for each and every customer. 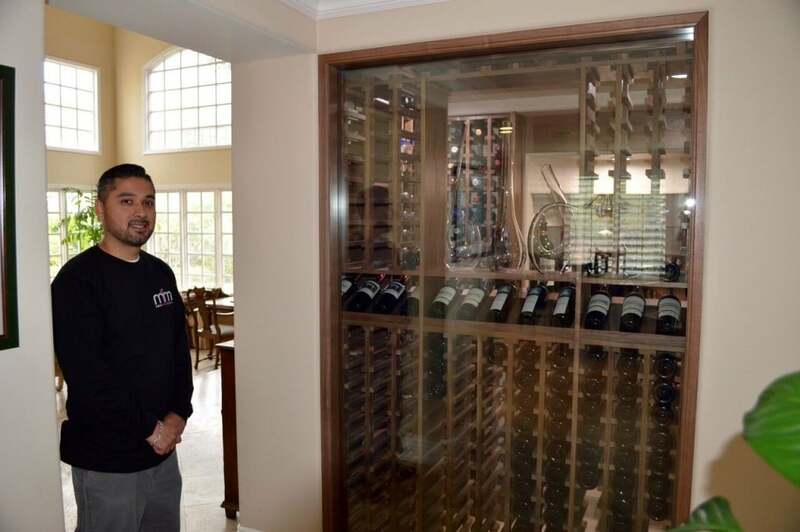 Mario Morales, the founder and lead HVAC technician of M&M Cellar Systems, is standing beside the beautiful residential wine storage space in the client’s home in Calabasas County, Los Angeles, California. Mario has over 10 years of experience in providing quality services for all types of wine refrigeration equipment.